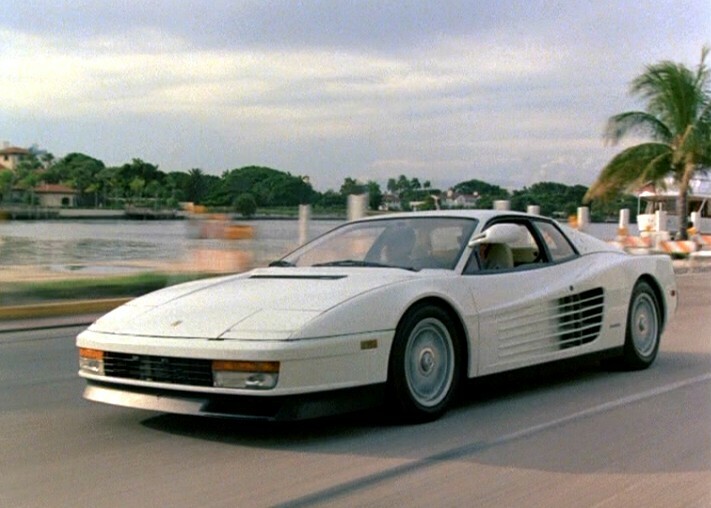 IMCDb.org: 1986 Ferrari Testarossa in "Miami Vice, 1984-1989"
Crockett's car in seasons 3 to 5 (1986-1990)... Pic is currently unavailable. 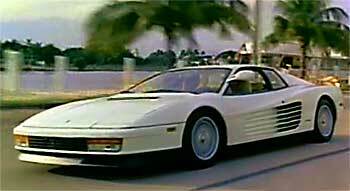 The Testarossa debuted in the 1986 fall season opener as a black version driven by IRA gunrunner Sean Carroon. The exoticar was a fitting image for high rolling terrorists dealing in hand held Stinger missiles. 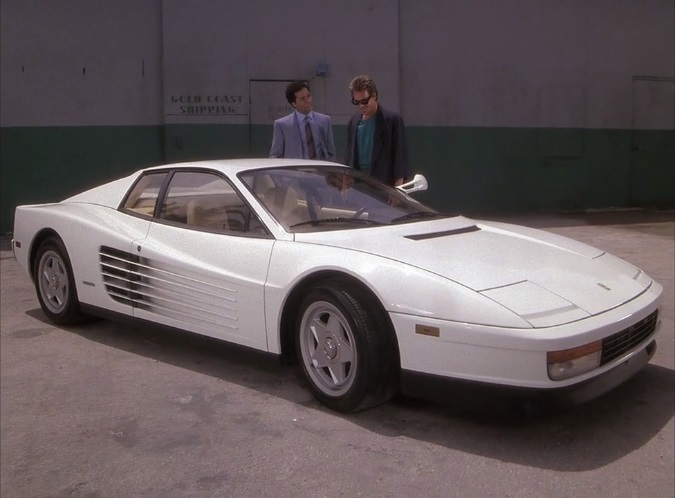 Although the episode credits read "Crockett's Car Furnished by Ferrari North America", Sonny was yet to drive his new car. 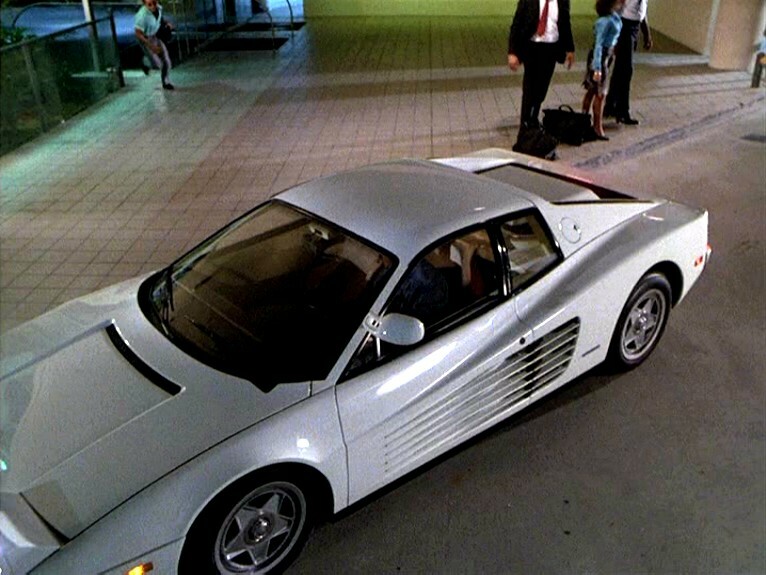 Michael Mann needed a plot device to introduce the Testarossa, so he had the gunrunners launch a Stinger missile at Crockett's prized Daytona and blew it up before his very eyes. A month later (the next episode), Lt. Castillo told a still-grieving Crockett to check out back for his new car. 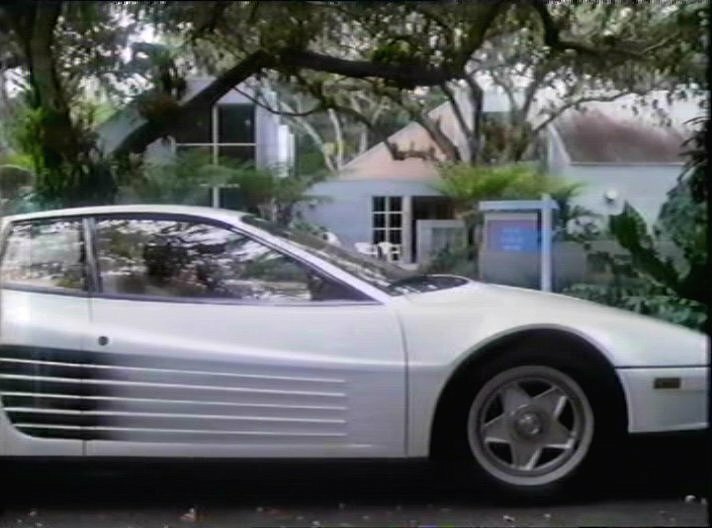 Sonny was greeted by a white Testarossa, Florida license plate ATF00M. He proudly recited the specs of his new toy to Rico, "345 hp and 180 mph!" Much like his treatment of women, Sonny soon forgot about his past relationship and eagerly moved on to the new. Two show cars were provided by Ferrari North America and were originally delivered black, but were later repainted white for better contrast at night. In addition, a stunt car was created by the Roberts Motor Co. by beefing up a 1972 DeTomaso Pantera chassis with salvaged Testarossa body parts. The mid-engined Pantera replicated the Ferrari much closer than the Corvettes which were used to create the Daytona look-alikes. The Testarossa was the first Ferrari built expressly for the American market. Introduced in late 1984 at the Paris Auto Salon, it was brought to the U.S. in 1985 with a sticker price of $87,000. A waiting list was immediately created, and deliveries were back ordered through 1986. Rather than follow the traditional Ferrari numbering scheme, this new model was simply known as the "Testarossa" in reference to former Ferraris. Testa Rossa, or "Red Head" (the cam covers were painted a bright red, hence the name) was the original name of the 1956 4-cylinder racers and later used for the 1958 250TR race car which used the trademark V-12. From the mirror you can tell it's an early TR, probably an '85 or '86. On some episodes the Pantera based clone is very evident, you can usually tell from the seats, wheels and the godawful finish on the A-pillars. Au boût de deux saisons, Ferrari North America en a marre de voir une fausse Daytona tenir la vedette dans une série (où elle se fait designer par « la Ferrari ».) 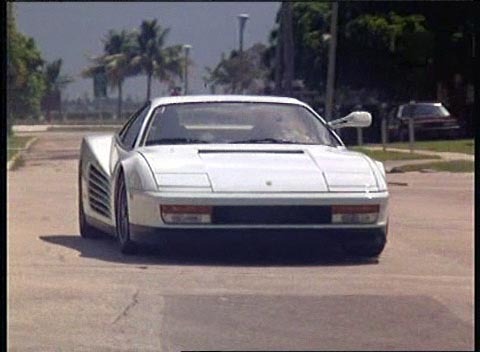 Il propose de fournir à la production deux Testarossa noires (plus une couleur argent pour Don Johnson, qu’il a revendu bien des années plus tard, lorsqu’il fut en interdit bancaire) afin de remplacer les « Daytona ». 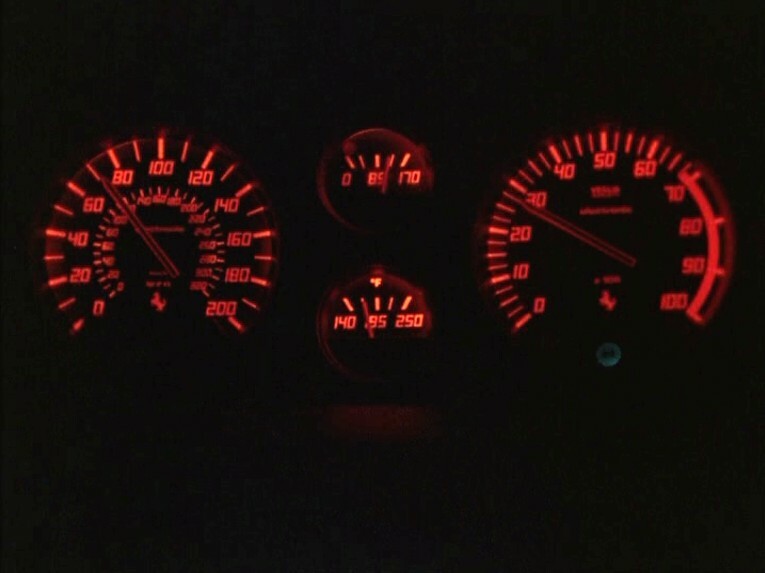 Mann les fait repeindre en blanc (pour un meilleur contraste la nuit) et remplacer le 12 cylindres boxer par un V8 de Corvette (car le moteur Ferrari est jugé trop fragile!) Pour les cascades, ils utiliseront une Pantera munie d’une carrosserie de Testarossa. ben68 wrote In addition, a stunt car was created by the Roberts Motor Co. by beefing up a 1972 DeTomaso Pantera chassis with salvaged Testarossa body parts. The mid-engined Pantera replicated the Ferrari much closer than the Corvettes which were used to create the Daytona look-alikes. I take issue with that. The Pantera clones look worse than most Fiero-based clones (and at least the Daytona clones were consistent with each other). The one-piece nose of the Pantera-based stunt cars look too short, the doors too long, and the whole thing rides too high on widened chrome wheels which stick out like a sore thumb. What's worse is that it appears as if the Pantera's roof was worked into the design, resulting in an steeper A-pillar that has an unsightly kink as it meets the roof. Anyone got $1.75 million to spare? Because apparently one of the two main Testarossas used in the show is up on eBay for that much. carcrasher88 wrote Anyone got $1.75 million to spare? Because apparently one of the two main Testarossas used in the show is up on eBay for that much. Once again, the car's up for auction. One of the best Ferraris ever. 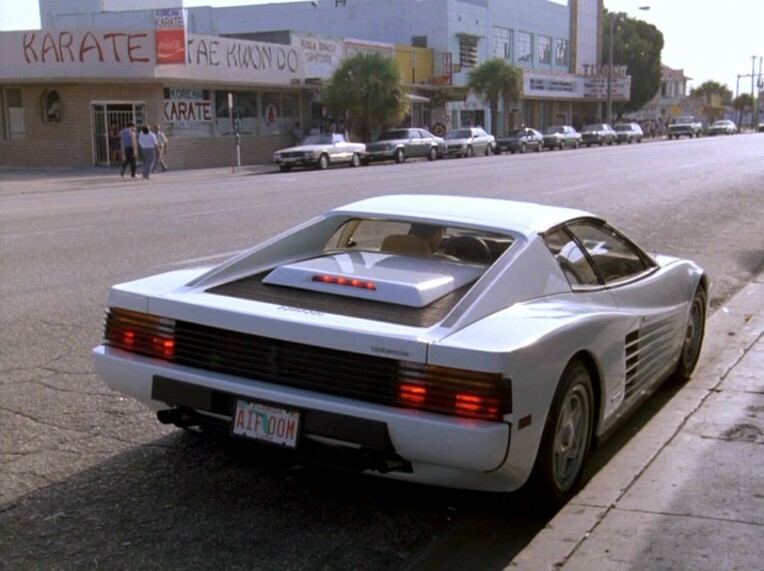 ben68 wrote Two show cars were provided by Ferrari North America and were originally delivered black, but were later repainted white for better contrast at night. 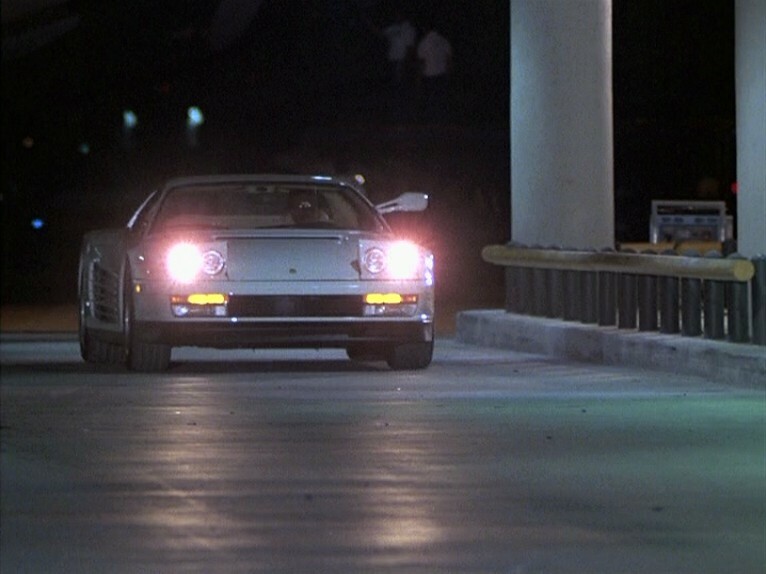 In addition, a stunt car was created by the Roberts Motor Co. by beefing up a 1972 DeTomaso Pantera chassis with salvaged Testarossa body parts. Same account given in a magazine which arrived today. Apparently the Pantera was "tired" before conversion, and Ferrari North America insisted that it was destroyed after the show ended as part of the supply agreement.